Social responsibility has become an important part of how businesses are operating today. For Debbra Sweet, social responsibility and community involvement have been part of her life and core values since she was just a young girl. Debbra was raised in a household and involved in businesses which always had a strong element of taking care of others who are in need. She and her family served others with a heart of giving without expectation of reciprocation. She also had family involvement in many arms of military service. These attributes laid the foundation for Sweet to develop two annual charity outreach events that support local military families in need. Between her dad, uncle’s, cousins and in-laws, active-duty service in the Army, Marines, Air Force, Coast Guard and National Guard was covered. Debbra considered serving in the Marines after she was chosen for the John Philip Sousa National Honors Band in 1985. That opportunity flew her to Washington, DC where she performed with the Marine Corps band, the Presidents Own Band and the silent drill team. Thoroughly enjoying that rare opportunity she witnessed many others with the same dedication and commitment she had amongst the Marines she was performing with. Sweet knew she would be unable to actively pursue a tour of duty due to some of her physical conditions that would have affected her acceptance into the service. Instead, she chose a route that serve those who serve. During many years of her professional career, Debbra has worked with the military. In 2011 she launched to outreach programs as part of her personal desire for social responsibility.The first one takes place each Fourth of July. The Annual Freedom to Ride gathers local individuals and business owners for the purpose of a caravan motorcycle ride to military hospitals and veterans homes the morning of each 4th of July. Many people are unaware that Vets who served to defend the freedom of this country are unable to be out of the hospital or their long-term care home on Fourth of July. The freedom ride attracts both able-bodied Vets and civilians from amongst the American Legion posts, VFW’s, motorcycle riding clubs, and local business owners. These supporters of the event recognize the importance of honoring those who served to defend our freedoms. As the tradition of the freedom ride continues, so does the size of participation and the outreach to new hospitals and homes. Starting in 2015, donations and ride registration fees kickoff the second charity event Sweet started called the Heart to Feed 100 Food Drive and Ride. The Heart to Feed 100 Food Drive and Ride started out in 2011 as an initiative by Sweet to be able to deliver all the fixin’s for a full Thanksgiving meal to military families of four members who are known to be going through very difficult family and financial circumstances. Debbra was inspired to create this food drive out of two influencing circumstances from her own life. The first one being the fact that in her early years, she and her family hosted a large event Thanksgiving morning serving families in the town she grew up in. The second influencing moment came when she moved to California and had her first Thanksgiving here. In stark contrast to how her holidays were growing up, Sweet spent her first Thanksgiving eating Top Ramen in a laundromat in Southern California. That moment made her realize that there were many other people, especially those in the military who are in the same circumstance and she wanted to do something about it. Today: the Heart to Feed 100 Food Drive and ride as grown beyond feeding 100 military families in need. 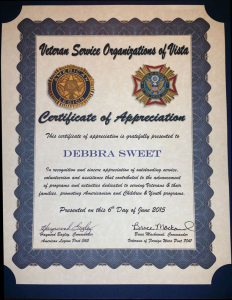 Sweet initially aligned with Vista Motorcycle and the American Legion Post 365 Riders in Vista California in 2011 and introduce them to the idea of taking care of these local families. The Riders of the Post embraced the idea from day one, and together this tradition continues to grow and the outreach to take care of other families expands. The goal for 2015 is to feed 200 known that military families that are in a hardship circumstance. If you the heart to support either of these events please visit: www.AnnualFreedomRide.com/home or www.AnnualFoodDrive.com You can also contact Debbra for more details about donations and sponsorships.